Happy Birthday Jan Ormerod (Lizzie Nonsense) and Gary Crew (Memorial). Neptune, the first planet in our solar system found by mathematic prediction rather than observation, was discovered in 1846. Read Next Stop Neptune by Alvin Jenkins, illustrated by Steve Jenkins. In 1962, the Lincoln Center for the Performing Arts in New York City opens with the completion of the Philharmonic Hall, home of the New York Philharmonic. Read The Philharmonic Gets Dressed by Karla Kuskin, illustrated by Marc Simont. It’s Love Note Day. Read Moxy Maxwell Does Not Love Writing Thank-you Notes by Peggy Gifford, illustrated by Valorie Fisher. It’s also Dogs in Politics Day. Read My Senator and Me: A Dog’s Eye View of Washington, D.C. by Senator Edward M. Kennedy, illustrated by David Small, and First Dog by J. Patrick Lewis and Beth Zappitello, illustrated by Tim Bowers. For National Dog Week, which began yesterday, I’d like to look at a highly original and amusing protagonist, Thacher Hurd’s Art Dog. In terms of children’s book, Thacher Hurd has lived a charmed life. He was the son of not only one, but two, great children’s book creators—writer Edith Thacher Hurd and artist Clement Hurd, who illustrated many classics including Goodnight Moon. 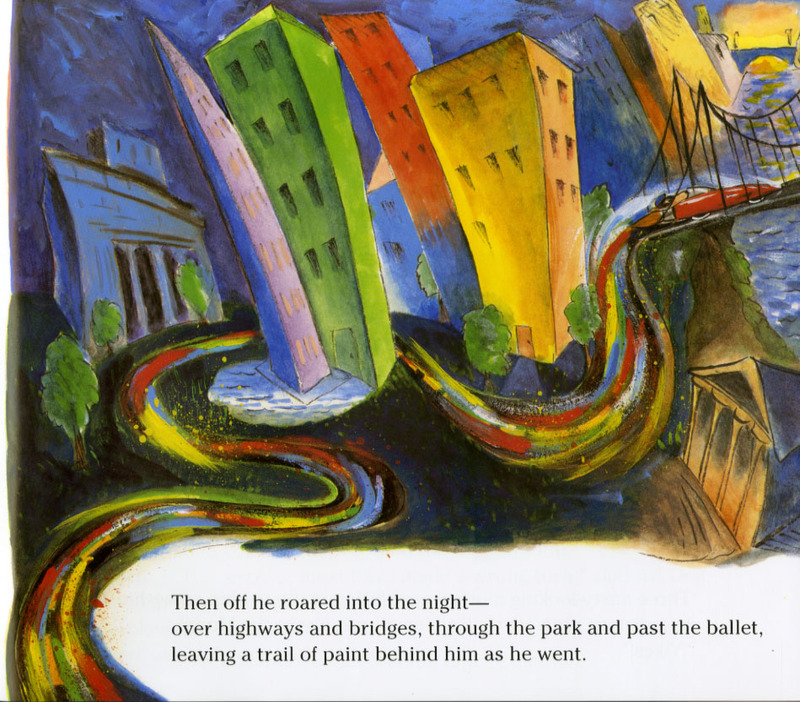 As a child Thacher met Margaret Wise Brown, Maurice Sendak, and Don Freeman, all friends of his parents. Sometimes this led to not-so-desirable situations—Margaret Wise Brown once wanted young Thacher to sleep in an all-fur room that she had made for him, but Thacher didn’t find it to his liking! But just as his father was known for his gentleness and quietness in books, Thacher went on to create titles that have been described as zany, high-octane, and fast-paced. 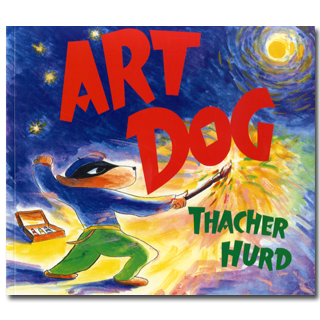 In 1996 Thacher presented the saga of Arthur Dog, guard of the Dogopolis Museum of Art by day—where he protects masterpieces inspired by Pablo Poodle, Henri Muttisse, and Vincent Van Dog—but a crime fighter and graffiti artist by night. He drives the Brushmobile, with a tank that gets filled up with bright colors at the Acme Paint Company. Rather than exclaiming “Bam” or “Pow” like other super heroes, Art Dog is more likely to say “Touché” or “Paint!” When Dog Vinci’s painting “Mona Woofa” is stolen, Art Dog sets out to find the culprit—because he himself has been accused of its theft. While working on the book, Thacher turned to Maurice Sendak for advice. He also received input from his wife, Olivia, who has been at his side as critic for many years and reads all the dummies for his books. Both encouraged Thacher to revise the original story and make the plot tighter. Often editors get credit, and should, for helping shape a book. But in the case of Art Dog a childhood mentor and Thacher’s wife helped him create a book that has thrilled critics and children alike; Art Dog has won the Vermont Red Clover Award, selected by children of the state. Art Dog naturally lends itself to learning activities like identifying the painters spoofed in the book or even having children take their favorite paintings and replace the main character with a dog. Those in the Seattle, Washington, area will be able to see a musical based on Art Dog this season. The rest of us just need to pick up this timeless book and enjoy the humor and the mayhem. Originally posted September 23, 2011. Updated for . So glad you shared this as many of us who love Hollins University summer program in children’s literature missed out when Mr. Hurd spoke to the students & appeared at the truly cool Hollins Art Museum this summer. I just read this at the library. It’s amazing t me what a printer can do with an artist color work, in book form. I’d love to see the originals. Perfect timing! I was just looking for books to use for an art-themed storytime. So far, I had The Dot by Peter H. Reynolds, Little Smudge by Lionel Le Néouanic, Beautiful Oops by Barney Saltzberg, and Too Much Glue by Jason LeFebvre. I think this looks like a great addition to that list. Thanks for the recommendation!